What an odyssey the career of Against Me! has been; from anarcho-folkpunk, through mid-western americana, to transgendered themed rock’n’roll. Ever since quitting the teenage politics of anarchism, Tom/Laura has been missing a muse or subject to his/her writing. ‘Searching for a Former Clarity’ was mostly about fan back-lash to selling out, ‘New Wave’ about the stale nature of modern music, ‘White Crosses’ was the band running out of lyrical steam. The most interesting moments on these records we’re the brief allusions to his double life as a women. “If I could have chosen, I would have been born a woman. Now we have a full album all about it (nearly all about it). 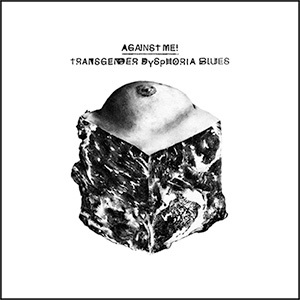 ‘Transgender Dysphoria Blues’ takes us through familiar sonic territory with Petty-esq bar rock tracks (FuckMyLife666, Dead Friend), heavier modern rock (True Trans Soul Rebel, Osama Bin Laden as the Crucified Christ), punk (Drinking with the Jocks), and folk (Two Coffins, Transgendered Dysphoria Blues). Some of these songs are absolute slam-dunks, compelling you to listen repeatedly. The title track kicks things off in a style reminiscent of the older Against Me! screaming about working class alcoholism and tragedy. This time it’s about a trans-women wishing boys would see her as a real (biological) women, how will the angry ballad fists cope? ‘True Trans Soul Rebel’ follows this like a catchy and angry punch in the face. ‘FuckMyLife666’ picks up the sound AM! left with on White Crosses and expands into a masterpiece. Some of the other tracks feel like filler. ‘Paralytics States’ features some of the album’s best lyrics and energy but fails to deliver on hooks, the title ‘Osama Bin Laden as the Crucified Christ’ is more interesting than the actual content of the song. ‘Unconditional Love’ has interesting lyrics, but is too musically boring to merit more than a passing interest. Many of the other tracks fall somewhere in between the hit and filler spectrum, making a well-rounded album that falls short of classic. Overall, I’d chalk this up as a victory for the band. The mountains outweigh the valleys.